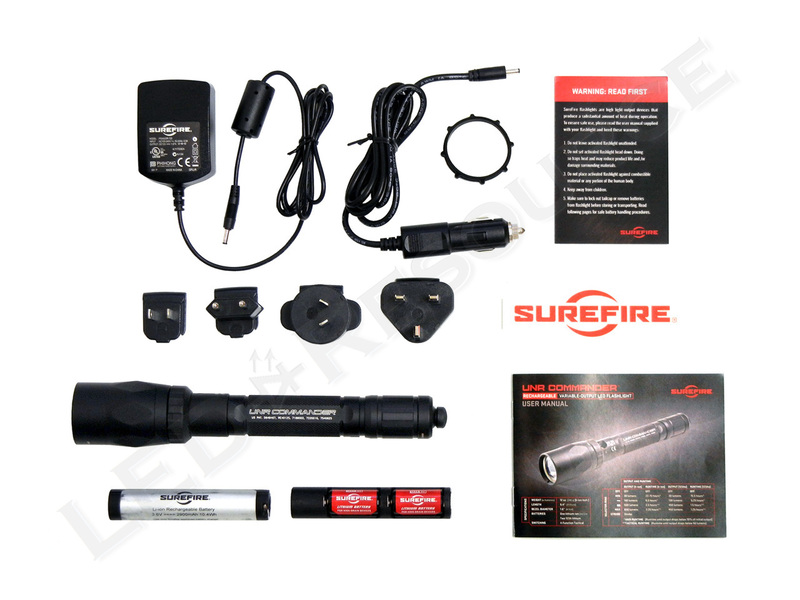 Expanding on SureFire’s line of rechargeable LED flashlights, the Surefire UNR Commander is a variable output LED flashlight that is also the first to feature SureFire’s exclusive 4-Function Tailcap Switch with MaxBlast. This new multi-function tail switch allows both momentary and constant-on operation, and MaxBlast provides instant access to maximum output. 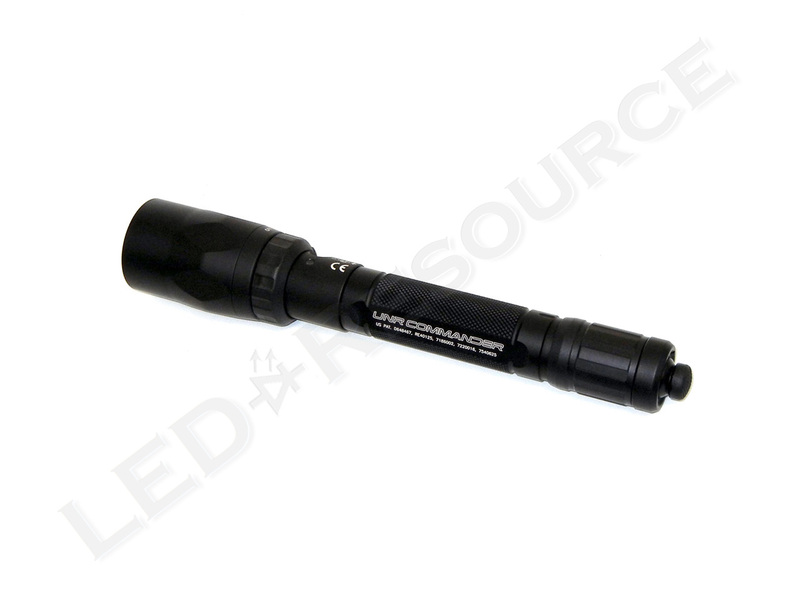 Maximum output of the UNR Commander is 800 lumens, with lower output modes and strobe available using the six-position selector ring. Weight with Batteries: 12.0 oz. 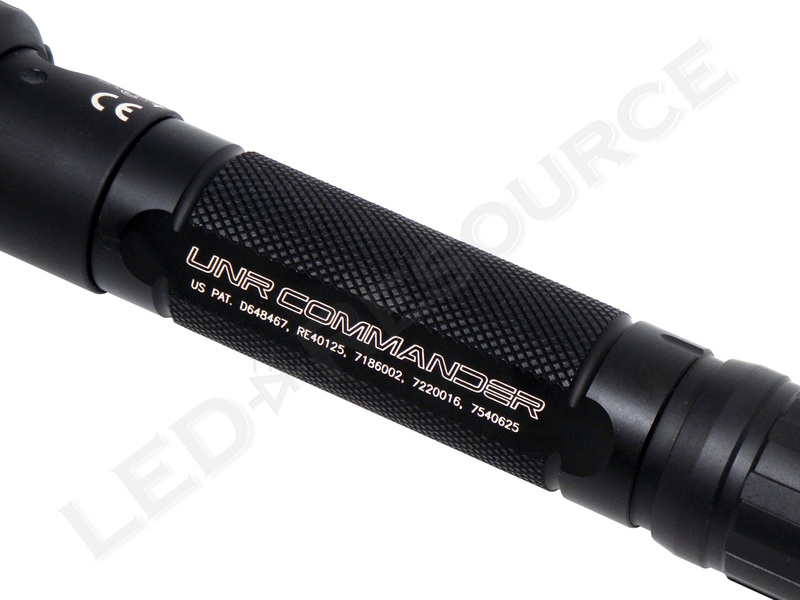 MSRP for the UNR Commander is $595, and the light is only available in black. We received our UNR Commander in pre-production packaging, but production models will come in a cardboard box with similar contents, including: SureFire UNR Commander, Lithium-Ion rechargeable battery pack, “Dual Fuel” battery carrier with 2 x SF123A batteries installed, AC adapter with international adapters, 12V car charger, rubber anti-roll ring, and user manual. 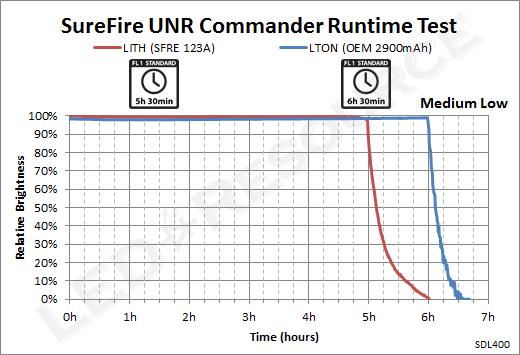 Powered by a proprietary lithium-ion battery pack, the UNR Commander is “Dual Fuel” capable and can also use a battery cartridge with 2 x 123A lithium primaries (rechargeable lithium-phosphate batteries are not supported). The UNR uses the same battery pack as the R1 Lawman, which has a Panasonic Nickel-Oxide New Platform (NNP) based 2900mAh lithium-ion battery that is rated for 500 full discharge cycles with a 20% loss in capacity (up to 2000 cycles with partial discharge cycles). With a length of 9.4” long, the UNR is just a bit larger than the average mid-sized rechargeable light. The aluminum body is type-III anodized for maximum protection against scratches and corrosion. 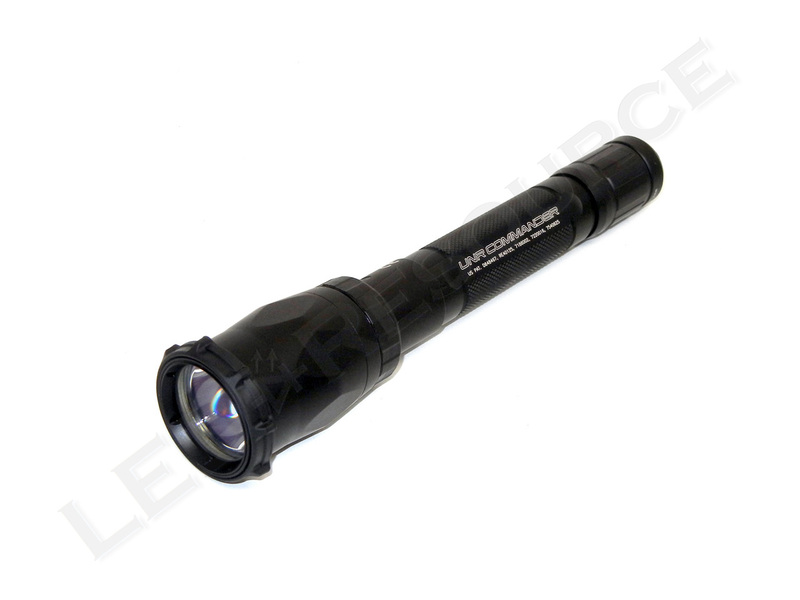 Behind the non-crenelated bezel is an anti-reflective coated glass window that protects the Total Internal Reflection (TIR) optic. 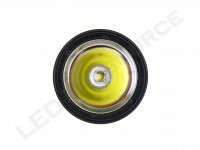 Flat areas on the head stop the light from rolling away on a smooth surface. Modes are activated depending on the position of the selector ring, which has detents for each mode and a raised notch to indicate the current selection. On the tail cap is SureFire’s new 4-Function switch with MaxBlast, which allows direct access to maximum output from any mode except strobe. For momentary operation, press the switch halfway for the selected output level, or all the way for maximum output. For constant-on operation, push the switch halfway to the side in any direction for constant-on in the selected output level, or all the way to the side in any direction for constant-on in maximum output. 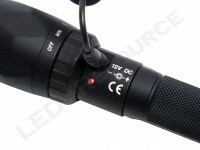 Four output levels, plus strobe and off, can be activated using the selector ring. Deactivates the light and prevents accidental activation. 4% mode for 30 lumens. 20% mode for 140 lumens (130 lumens with 123A’s). 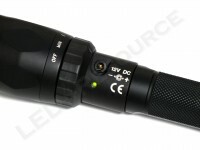 60% mode for 500 lumens (450 lumens with 123A’s). 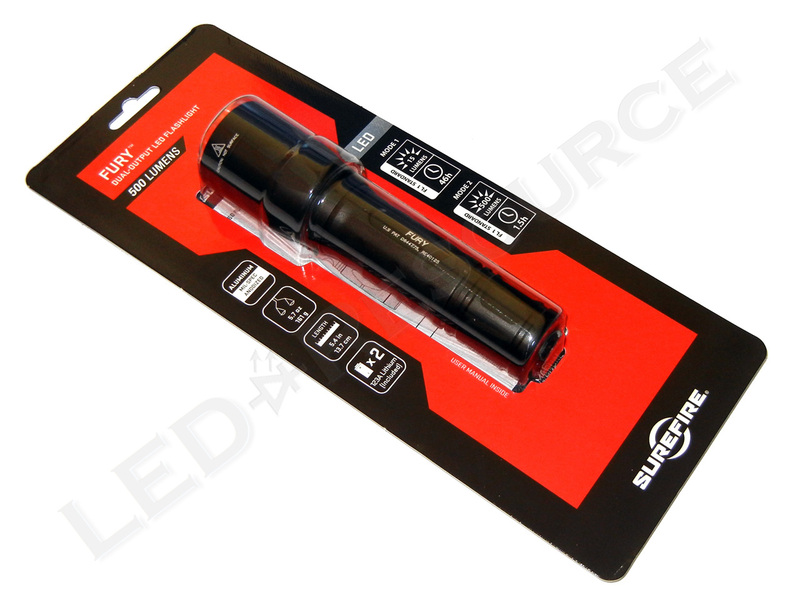 100% mode for 800 lumens (450 lumens with 123A’s). Maximum output 800 lumen strobe (450 lumens with 123A’s). Using a Cree XM-L LED, the UNR has a maximum output of 800 lumens and 20,000 candela. Overall performance of the UNR is fairly similar to the R1 Lawman, with the biggest difference being the TIR optic, which creates a bright, well-defined, hotspot with plenty of spill. 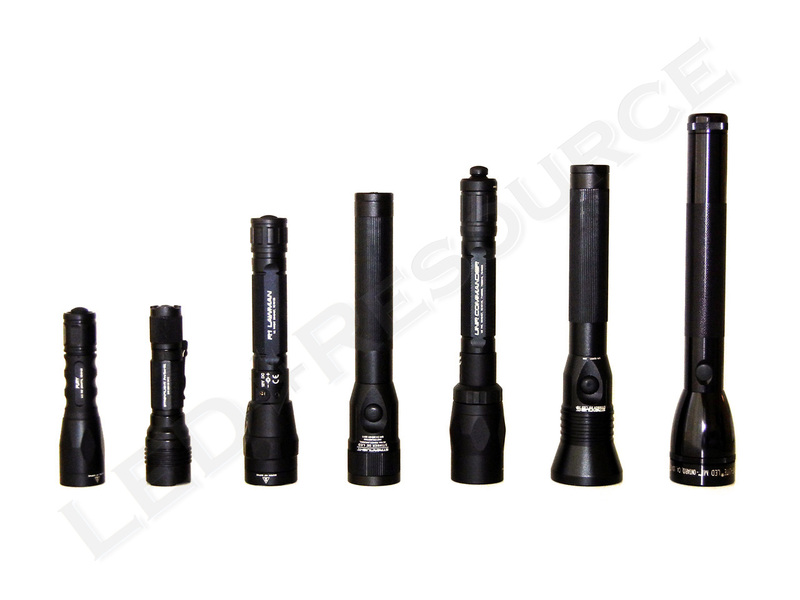 SureFire uses tactical and total runtime, which are not necessarily consistent with the ANSI FL-1 Standard specifications that we are using. 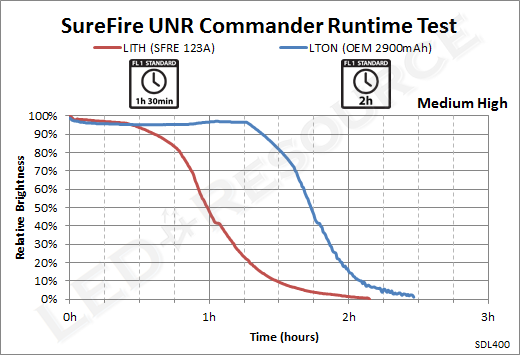 For the UNR, maximum and medium high output runtime are given as tactical runtime (measured until output drops below 50 lumens), and lower output runtimes are given as total runtime until battery exhaustion. 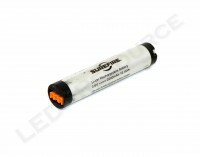 When using the rechargeable battery, the UNR reduces output to 500 lumens after a 2-minute burst of 800 lumens. Due to non-linear brightness perception, this reduction during actual use is not as noticeable as the numbers seem to imply. Included with the UNR is a rubber anti-roll ring, which gives the light more stopping power when set down on a smooth surface. Carrying the UNR bezel up in an open-bottom holster makes the light prone to accidental activation, which happened to us several times during our testing period because the UNR’s tail switch protrudes by more than a quarter inch. Not only can it catch on objects (such as seat cushions) and activate the light in constant-on, but it also makes the switch more susceptible to damage.If you are planning on using the UNR as a duty light, finding a suitable holster can be a challenge. The new 4-Function Tailcap Switch intuitive and easy to use, but it’s just as easy to activate accidentally. 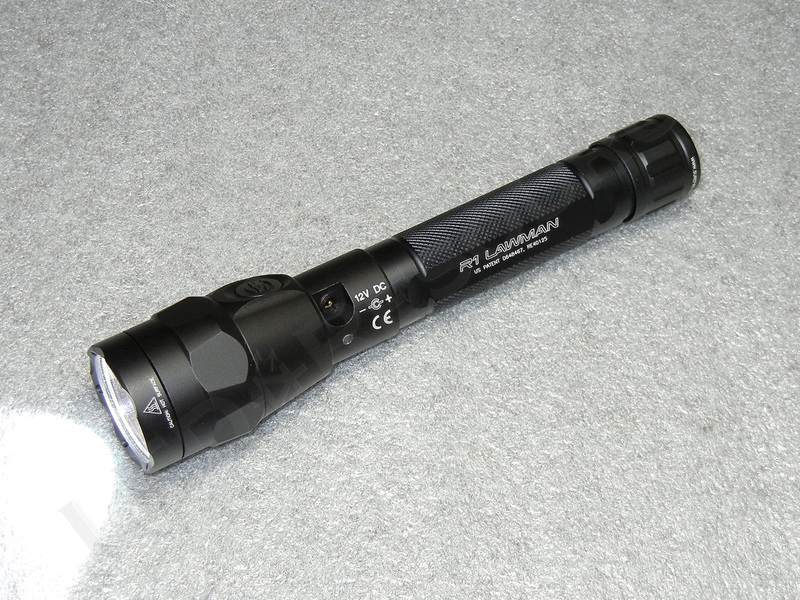 Four output levels ranging from 30 lumens to 800 lumens makes the UNR versatile, and changing modes is as simple as twisting the selector ring. Unlike many lights that use reflectors, such as the SureFire R1 Lawman, the UNR Commander’s TIR optic produces a unique beam pattern with a balanced combination of flood and throw. 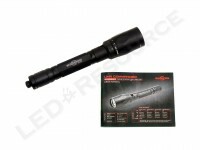 However, the SureFire UNR Commander is no ordinary flashlight – this is one that has a MSRP of $595. 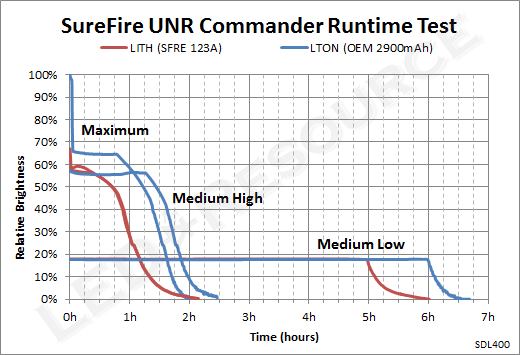 While there are many good things about the SureFire UNR Commander, affordability is definitely not one of its strong points. Man that’s a nice light. Thanks for the review Robin. Do the Commander and Lawman employ a timed power-saving step-down duty cycle (like Mag’s ML100/125, Mini Mag Pro, XL200, etc.)? 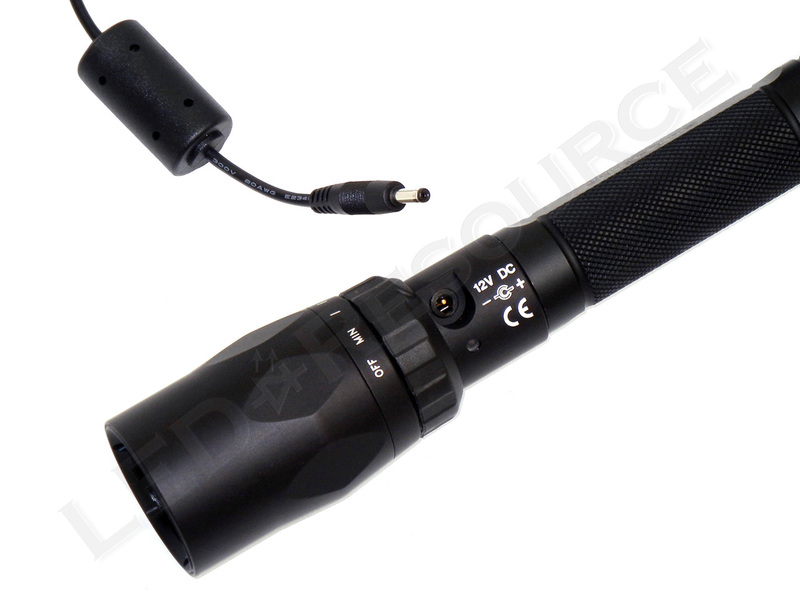 On maximum output, it steps down from 800 lumens to 500 lumens after three minutes. 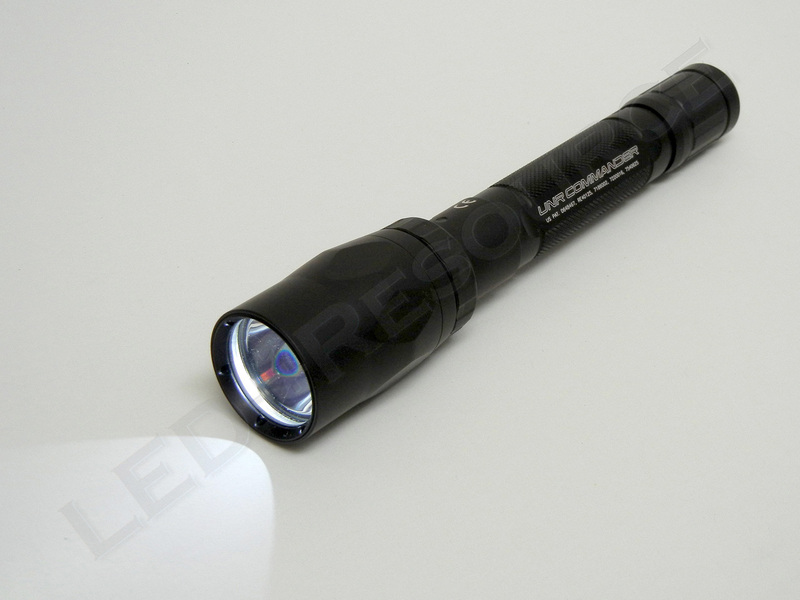 It’s the same with the R1, which steps down from 750 lumens to 500 lumens. Will duty cycling a surefire without a step-down regulation (specifically a fury) give you full power? Or is it putting out as much as it can the whole time, till it eventually dims all the way? If you rest the batteries and let the light cool down, you will get slightly more output, as heat makes electronic components less efficient. Otherwise, cycling the Fury won’t make a significant difference because it isn’t step-down regulated. I’d appreciate seeing a beamshot comparing the Lawman reflector to this “TIR” design. Does the TIR make it more floody & less distance? There is actually not much difference between the beam patterns of the R1 and UNR. Spill is almost exactly the same, but the UNR’s hotspot is more defined. I would expect the UNR to have slightly more throw. I’m really happy with the flood pattern of the Fenix TK22. 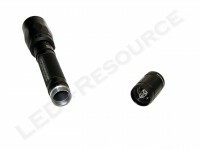 Want more lumens with that wide, even beam pattern !!! So whenever it’s activated at max, it will output full power for three minutes then down to 500 lumens each time it’s activated? Or does it just give you that 800 for 3 minutes per battery charge? Thank you for your review. Also how does its throw compare to the ub3t? Thanks again! It will be per activation, unless battery charge is insufficient. You will get better throw from the UB3T because of the larger optic, and the UNR has a wider beam pattern. We just got the UBR, which is the rechargeable version of the UB3T, and should have a review soon! Great! Thank you! By the way, can the unr be programmed for different brightness settings? At the moment, there’s no clear answer, but whichever is the case, getting all of the rechargeable lights released has higher priority. Hi robin, just wondering if you will put up review fir ubr invictus? I am in the market for that price range and still seciding between commander vs ubr invictus. 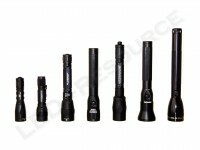 Could you please point out their main diff since they have the sane lumen? It’s very well built, and especially noticeable with the selector ring. Unlike the UNR and UB3T, which use plastic selector rings, the UBR has an aluminum selector ring. The selector ring has strong detents that make a solid click on every mode, so it’s almost impossible to accidentally skip through multiple modes. 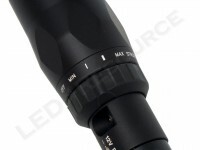 There are also a lot more output settings on the UBR, which is handy if you need finer output adjustment (the UNR only has three distinct output modes, since maximum output steps down to 500 lumens after 3 minutes of continuous operation). 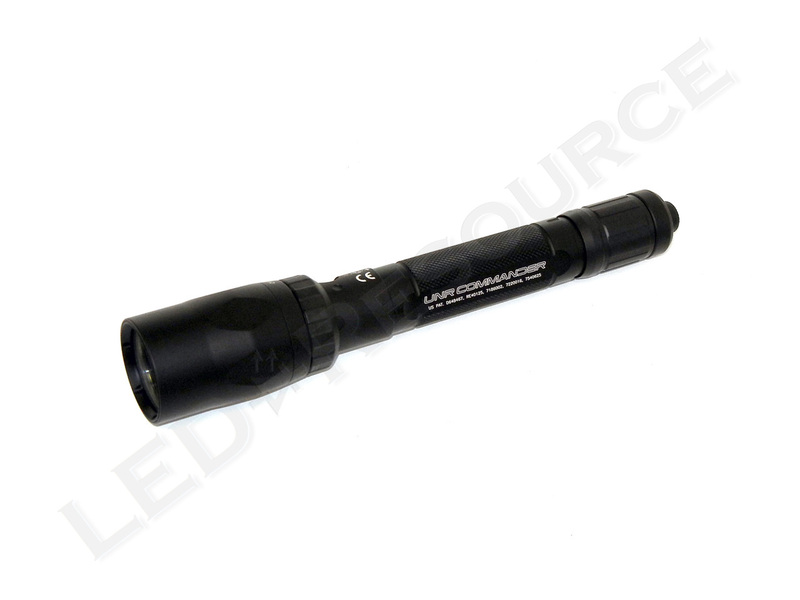 Finally, the optic in the UBR produces a tighter beam pattern than the UNR, which would be great for outdoor use. Two potential issues to keep in mind. 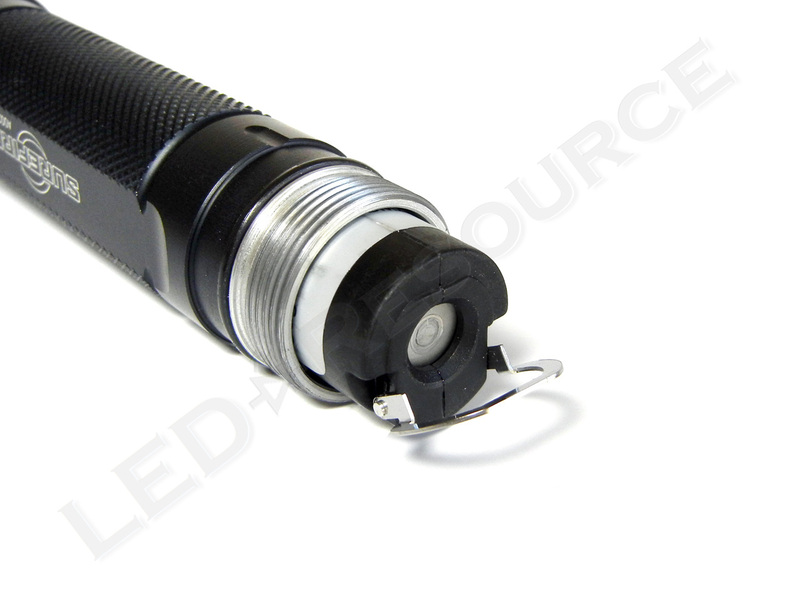 The position of SOS on the selector ring is between MIN and OFF, which means that if you switch the light to OFF while it is turned on, you will get a brief blast of 500 lumens (to avoid this, turn off the light from the tailcap and then switch the selector ring to OFF). Also, the 4-Function tailcap sticks out by more than 0.25″, which means that it can accidentally activate if you carry the light in an open-bottom holster. I’ve had this happen to me a couple times with both the UNR and UBR, and it usually activates in MaxBlast, which means that you will be turning on a small heater if you are wearing a jacket and don’t notice it immediately (yes, I’m speaking from experience…). Since both lights are already $400+, I would recommend the UBR if you don’t specifically need a smaller bezel diameter. 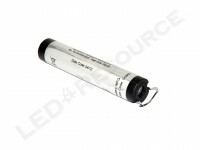 Both lights are approximately the same length, and the UBR is 9.75″ (~0.25″ longer than the UNR). If you would like more information, such as pictures or runtime graphs, feel free to send me an email (it’s in the “About LED-Resource” page). UBR. It’s 30,500 candela, compared to the UNR’s 20,000 candela. It’s not an immediately noticeable difference, but it definately shows outdoors (and on the test bench, our measurements show that the UBR is about 60% more intense). However, the UNR has a noticeable wider beam pattern (more spill). I will trouble you again. If i get an invictus, whats the main diff Between UBR and UB3T (other than the battery)?Economically, dont u think i’d better off getting an UB3T with SF LFP123? 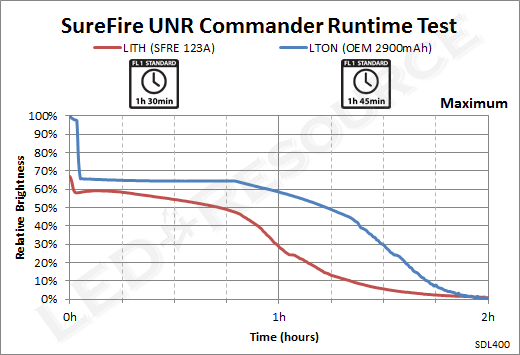 I read in terms on run time lfp 123 runs half comapred to the normal sf battery, but will not limit the lumen output. Could you comment on this? Is there any additional limitation/ disadvantage using these batteries? And do you know if i can charge lfp123 using 220volt? Using an odd number (other than one) of rechargeable batteries is a logistical nightmare. Since the UB3T is a three-cell light, and almost all lithium-phosphate chargers can only charge at most two cells together, you will have a difficult time charging/rotating batteries. I can go into technical explaination if you want, but basically charging two cells at once and then the last one alone will wear the cells unevenly. A better way to do it would be to charge them one at a time, but that will either waste a lot of time, or require three chargers. 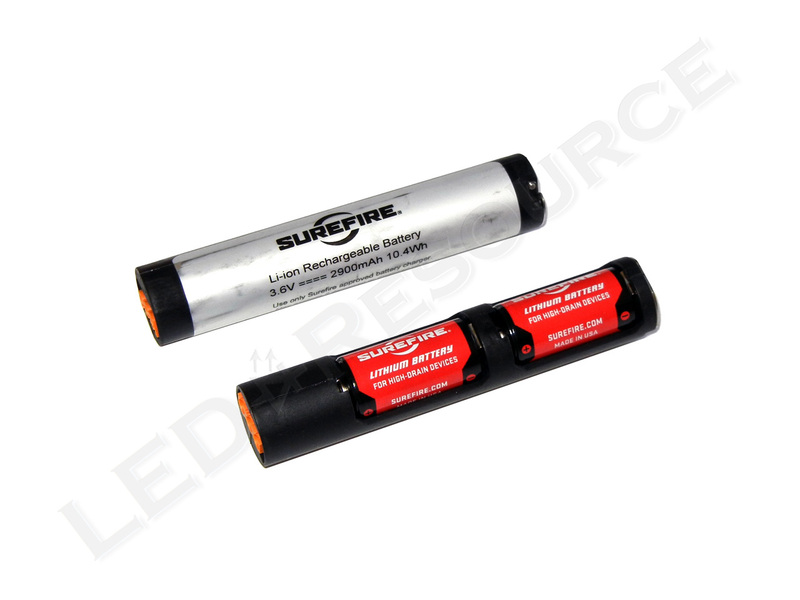 SureFire’s lithium-phosphate rechargeable kit includes a charger that will work with 220V (you will need to supply your own AC cable if you cannot use the North American plug), as well as 12V DC (so you can use your own AC adapter). 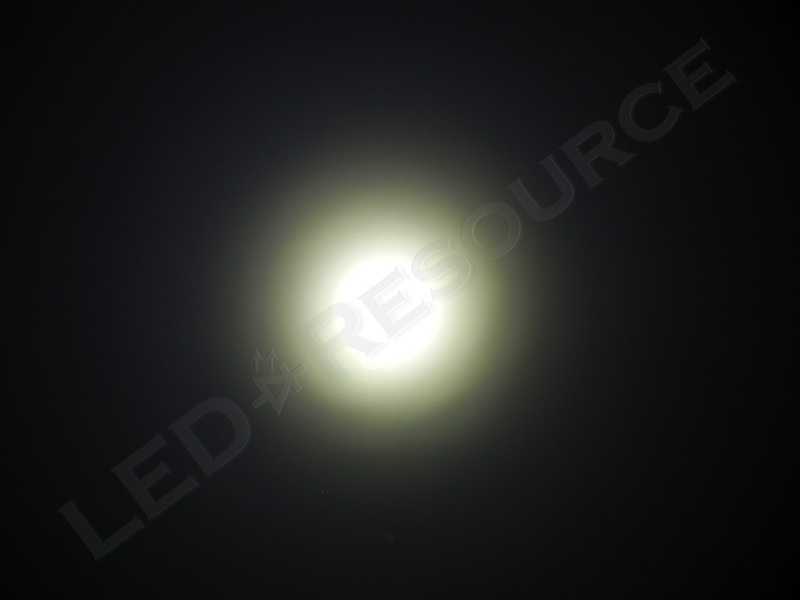 For most LED lights, using LFP123A instead of primary 123A will increase output by ~3-10% and decrease runtime by ~50%. You can see the exact behavior in our runtime graphs for 123A lights. 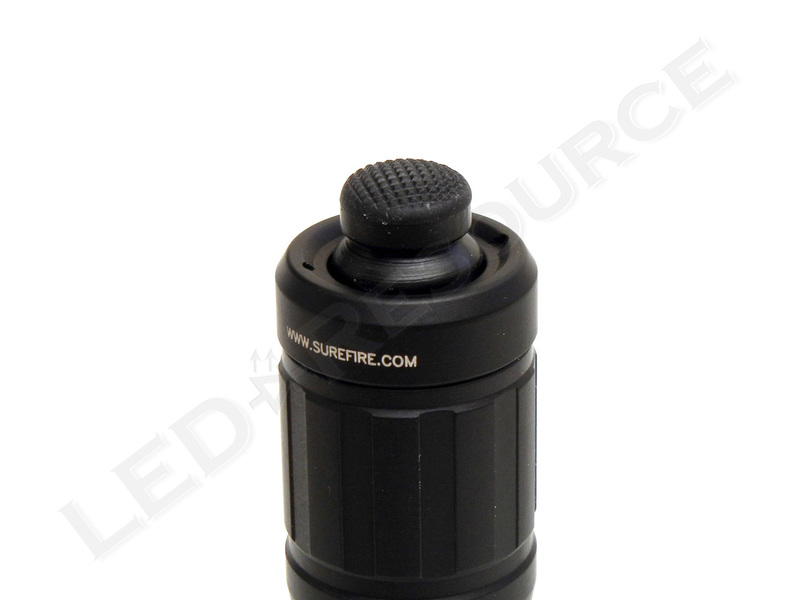 Other than using a rechargeable battery, the biggest difference between the UB3T and the UBR is the tailcap. The UBR’s 4-Function Tailcap allows constant-on activation/deactivation without having to twist the tailcap multiple times. If you tend to use constant-on more often than momentary, you will find frequent twisting of tactical tailcaps to be annoying.